Economize your gas money with two hikes for the price of one. Hackberry Canyon and Yellow Rock are separate hikes, but they are less than a half mile apart so you can easily do both in the same day. Hackberry Canyon is a kid-friendly hike, an easy stroll through a beautiful canyon carved into Navajo Sandstone. Yellow Rock, however, involves a steep climb up a near-vertical scree slope — challenging going up, near terrifying coming down. But the views from the top are more than worth the effort! A footpath leaves from the west side of the parking area, dropping down a sandy bench to the dry bed of Cottonwood Creek. Tunnel through willows, and continue west across patches of sand towards the jagged white rocks ahead of you. The notch in the canyon wall is your entrance into Hackberry Canyon. Walk through the Navajo Sandstone gate and begin exploring. You can wander as far as you’d like up this canyon; it’s more than 20 miles long in its entirety. Almost immediately, the canyon constricts. 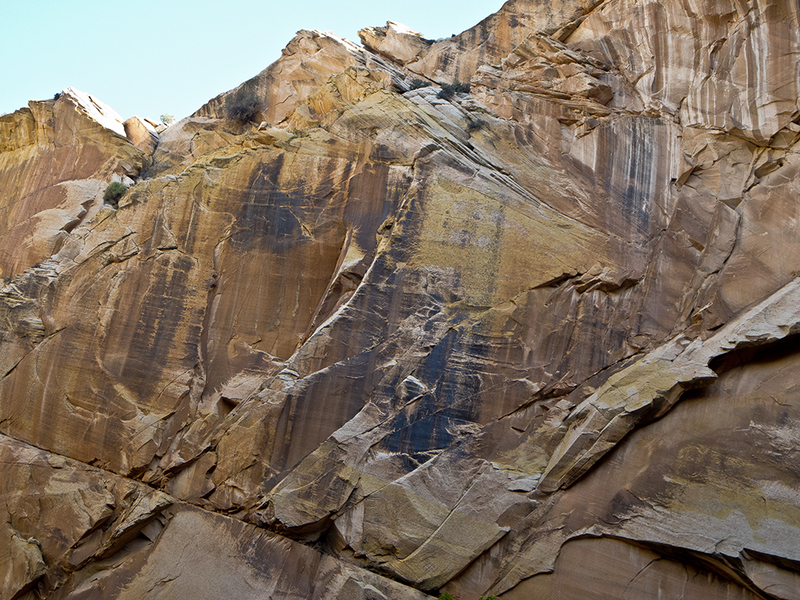 Your eyes will naturally rest on the canyon walls, as they’re spectacularly stained, sculpted, and crossbedded. Around 2 miles in, Hackberry Canyon opens up when the crumbly reddish Kayenta Formation replaces the white Navajo Sandstone. Feel free to wander farther, but this is a good place to turn around if you’re planning to hike Yellow Rock. Return the way you came, to the mouth of Hackberry Canyon at Cottonwood Creek. From the mouth of Hackberry Canyon, turn right and walk south down Cottonwood Creek. After hugging the white cliffs for about 0.4 mile, you reach a small drainage on the right. A cairn marks the entrance into the drainage. Follow the trail north, starting a steep (repeat: steep) climb up the right side of the drainage. Rest briefly at a saddle, admiring the incredible view of the upturn layers of the Cottonwood Canyon cockscomb, then continue up the loose scree slope to the top of a ridge at 5,100 feet. In 0.2 mile, you have gained over 350 feet in elevation. 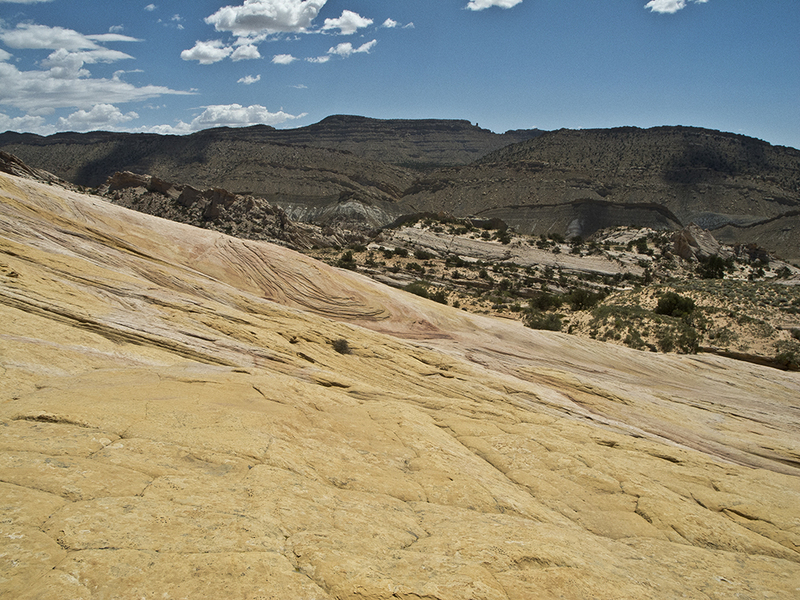 After cresting the ridge, you get your first view of the aptly named expanse of yellow sandstone, Yellow Rock. The trail bends to the left, heading west past a jagged rock outcropping. Cairns mark a route across patches of sand and slickrock but are unnecessary. Simply walk towards Yellow Rock and you’re headed in the right direction. You dip down slightly before making the final push to the summit, a 500-foot climb that starts at the base of Yellow Rock. There is no marked route to the top, but you can easily scale the steep slope by going straight for the calf-busting direct route, or switchbacking up the pillowy rock. 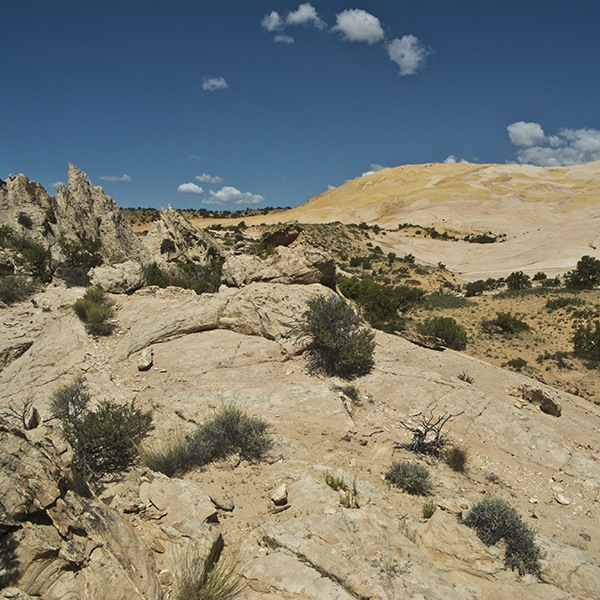 Yellow Rock gets its color from limonite, an iron ore that is present in the Navajo Sandstone. Swirls of orange, white, and tan are stains from evaporated pools of water. 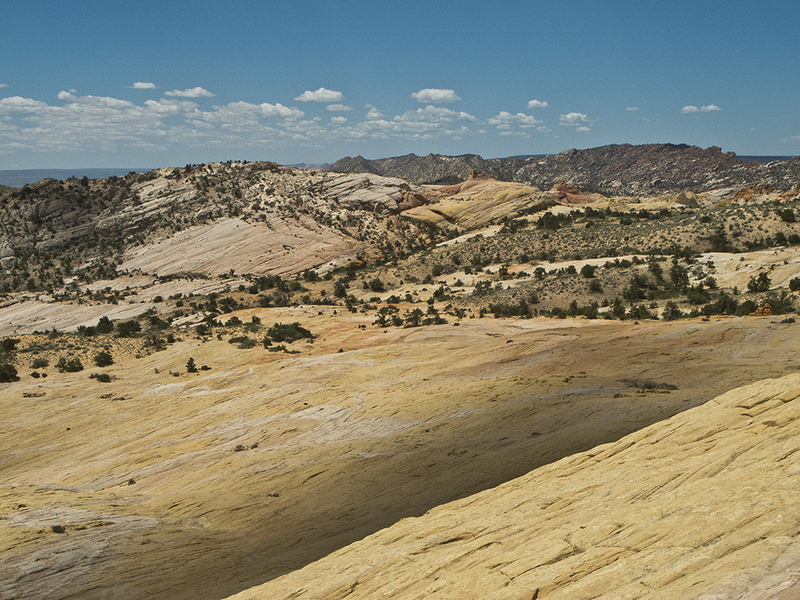 Atop Yellow Rock, you gain incredible 360-degree views: Hackberry Canyon to the north, the Paria River to the west, Cottonwood Canyon cockscomb to the east, and the Paria Plateau to the south. The colors and landforms look like a scene imagined by Dr. Suess. When you’re ready for the steep descent, retrace your steps back down. Be careful of your footing. 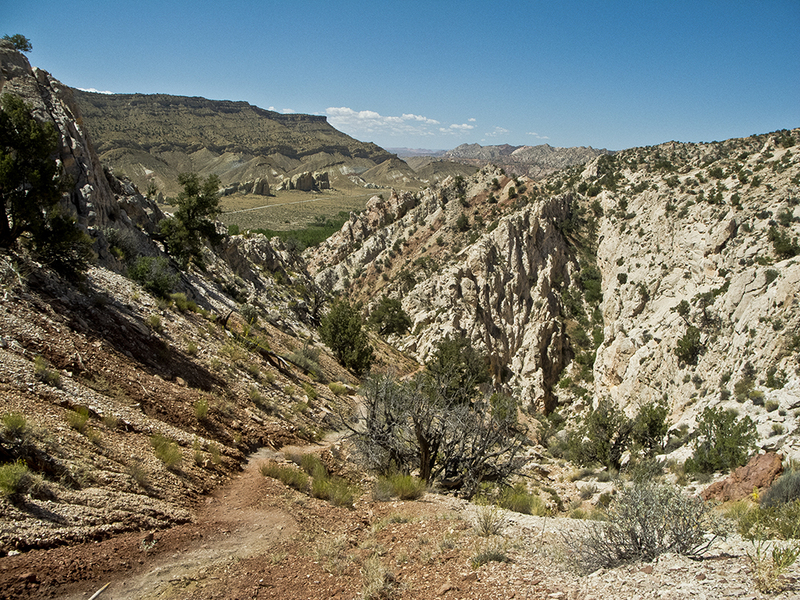 Cottonwood Canyon Road, which runs between Cannonville, Utah, and Hwy 89, accesses the trailhead for both hikes. From the north, head to Cannonville, a small town on UT 12 about 12 miles southeast of Bryce Canyon National Park. Take Kodachrome Basin Road (which turns into Cottonwood Canyon Road) for about 31 miles. Turn right onto an unmarked gravel spur that dips down to a looped parking area. From Hwy 89 partway between Kanab, Utah, and Page, Arizona, drive north on Cottonwood Canyon Road for about 15 miles. The trailhead is on your left. Note: Frequent flash floods alter road conditions. You can get latest conditions by calling or visiting the Escalante Interagency Visitor Center or Cannonville Visitor Center before you leave, and planning accordingly.